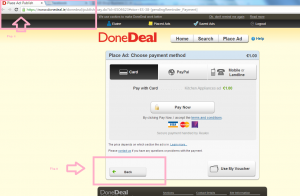 The only place you should ever give your bank account or debit or credit card details is on the DoneDeal website when you are paying for an ad. Computer/laptop users: http://www.donedeal.ie/donedeal/publish/ is the web address of the first page of the ad placement process if you are on a computer. Mobile/tablet users: If you are on your phone, just place your ad straight from the app. Or go directly to the DoneDeal website yourself in the browser. We do not request your bank account or debit or credit card details in a phone call, text message, email or email newsletter/ezine/promotional email - not even if we're giving a refund. We may direct you back to the Place an ad section. This is what a legitimate page looks like. We normally do vouchers in place of cash refunds eg if we have to remove an ad after a complaint or for breaching our T&Cs. For refunds on a card we do not need to ask you for your credit card number. We relate the charge to the ad number. 1) When placing an ad you have the choice to tick: No email responses for this ad. Leave this blank. You will receive messages into your email inbox and when you reply the emails go back and forth between you and people enquiring by email through the DoneDeal safemail system. 2) Don’t give out your email address via text message, phone or from within the DoneDeal safemail system. Ignore it. A text or SMS asking for more details to be sent by email is a common tactic used by scammers.